This is a post I started in November. I’m not that slow a writer but you know when you have to be motivated to do something? It has sat in my drafts but I just haven’t found my writing bug again until recently so after my recent post I thought I would dig this one out so I could update and post it. Anyway, I have been receiving these fabulous craft boxes in the post for the last 6 or 7 months and they are one of the best things I’ve ever signed up for. I discovered Crafty Creatives through a friend who mentioned her “craft box had arrived”. I was obviously intrigued and I checked them out. They are a small business placed in Glasgow and they provide a monthly subscription craft service. You pay £15 a month (plus £2.95 postage) and you receive a different themed box sent out around the middle of every month,. They’ve recently changed the way they compile their boxes, it used to be full of a couple of mini kits using a certain craft and it would guide you through your creation and it would also have some craft goodies such as bits of fabric, beads, embellishments, paint or anything appropriate that fitted that theme. Since January the boxes now have a large kit which is one particular craft for you to learn or revisit (if you’ve done it before) and you get all the info, guidance and all the tools and materials you need to make several creations of the particular craft. For £15 a month the value for money is fantastic. In the most previous boxes you got everything from a big bottle of PVA glue to art cards, art pens and pencils to jewellery pieces (a beautiful flower for a pendant, beads and charms), fat quarters of fabric to a sketch book. In the new boxes there have been Quilling, Marbling, Kumihimo and Silk painting kits. Which brings me on to my blog post! CCBox15 had a needle felting kit. I remember seeing this craft on Kirstie Allsopp’s program but I just didn’t have the kit to try. Thankfully this box gave me all I need to give it a go. It contained black and white wool, felting needle and instructions so I gave it a go one Sunday afternoon. I streamed Les Mis on my big TV in the living room, got the stuff out and I laughed, cried, sang and felted! 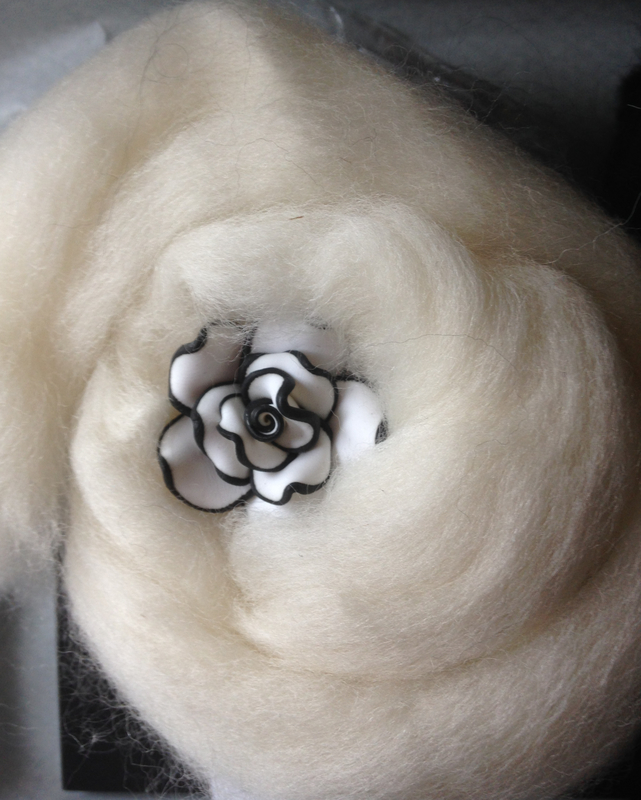 This is the white wool. The rose is just for decoration, it came in the box and I’m going to make a pendant for a very deserving friend as a present. As you can see it’s very fine and the black was just the same. There was quite a lot in the kit as you can see and I didn’t need all of it to make my sheep (the instructions were for a sheep so I didn’t want to try anything else for the first attempt, plus sheep are shadorable. It’s not the quickest craft in the world but it’s quite therapeutic. It’s all about shaping the pieces of wool with constant stabbing of the needle. The needle itself has very tiny prongs along it which catches the fibres and pushes and pulls them, almost knotting the fibres together and firming up the wool into a more felt-like texture. You need a larger ball of wool than you want the shape to end up as because it becomes smaller as the fibres mould together. It’s quite satisfying because it’s relatively easy to neaten up your shape and then to add other colours or to attach heads etc. In this case I made the body in white then made the legs, head and bobble tail separately and added them on. When you add them, because of the way you needle punch the edges first and then straight through the main part, it locks firmly so there’s no wibbly legs or bits falling off. Once I’d finished the sheep I made a little penguin with the rest of the wool, I still have a lot of the white left though (which shows just how much you get in the kits). I realise my sheep looks like it has a rabbits head but we’re all different, there’s nothing wrong with that! 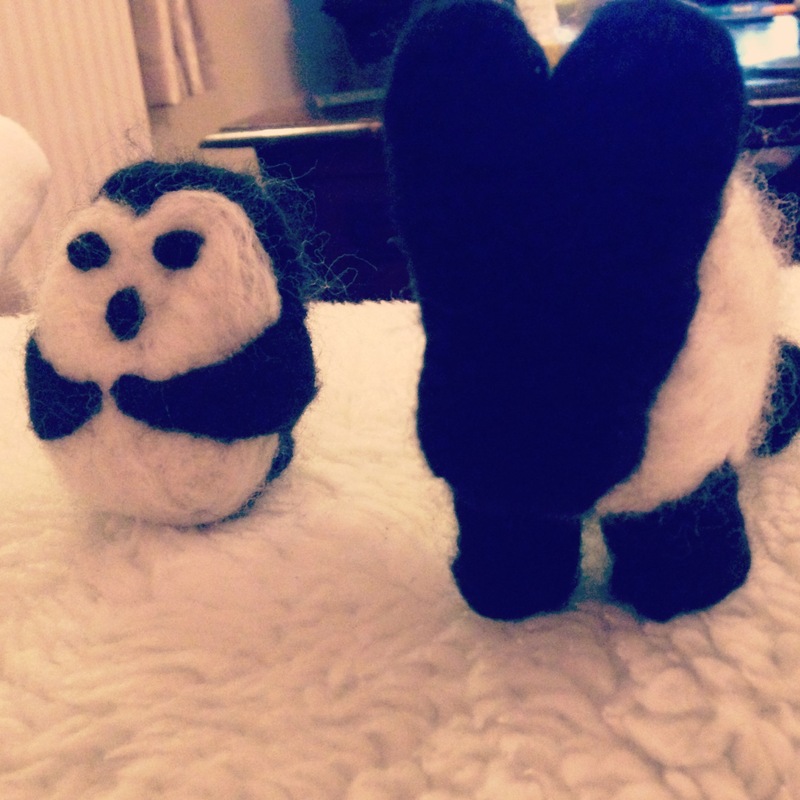 This entry was posted in Craft, Crafty Creatives and tagged crafty creatives, cute, felt, felted, felted penguin, felted sheep, felting, felting animals, wool. Bookmark the permalink.